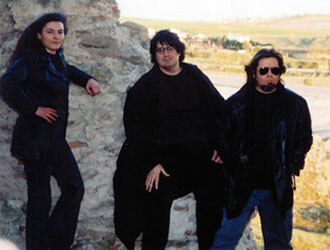 OCTOBER EQUUS (from left to right): Amanda Pazos (bass), Victor Rodriquez (keyboards), and Angel Ontalva (guitar). For music samples and booking please visit OCTOBER EQUUS page at MyspaceMusic. "While their first album seemed to have a bit of a 70s Italian prog flavor this new disc goes off in a different direction entirely. The band has now moved squarely into the RIO genre but not in a wild, free style. Undercurrents of Canterbury and King Crimson creep in as well but I tend to think of a more keyboard oriented Univers Zero. One thing that is consistent from album to album is the gravitas and dark element the band seems to be fond of. This is heavy listening but clearly rewarding. Somehow the band signed on with an obscure Russian label. It seems obvious that October Equus is eventually going to have a larger presence in the modern progressive scene. As good or even better than their first - but different! Highly recommended." – The Laser's Edge (USA) (October 2008). "They combine the stylistic unpredictability of Rock in Opposition (Henry Cow, Present, Univers Zero) with the surreal grace of the lesser known Canterbury jazz rock bands (Hatfield and the North). Especially when the saxophone is prominent, you might think to be in the presence of a long lost album by that obscure English band. The jazzy guitar solos betray also a strong King Crimson influence. Even though waterphone virtuoso Tom Zunk plays a solo on Unknown Pilot, it’s the floating mellotron carpets that make this piece a stand-out moment on a CD which is full of aha-effects. You shouldn’t really be looking for originality, but the way the band combines the best and most overlooked prog genres of the last few decades makes Charybdis a formally brilliant work that doesn’t sound pretentious, not even for one moment. While many progressive bands always showed off their instrumental versatility on mammoth tracks with epic lengths, October Equus only once break the seven minute border with Frozen Sea. Otherwise they stay in compact running times, which helps furthermore to make this one very listenable instrumental avant prog jazz rock album. Fans of the aforementioned artists will definitely get their hearts warmed by this brilliant three quarter of an hour long masterpiece. (Score: 9/10)" – by Pascal Thiel of DisAgreement (Luxembourg) (October 2008). "There is a really heavy Rock In Opposition influence in October Equus' music, and this particularly reminds me of the dark chamber-prog of Univers Zero, one of my fave bands from the whole RIO/Euro prog scene. Charybdis invokes eleven tracks of dark, heavy prog with a thousand confounding guitar parts, meandering guitar solos, droning mellotrons and jazzy piano clusters, heavy drumming that twists in and out of these labyrinthine song structures, bits of that Zeuhl sound, and best of all, lots of fantastic dark saxophone playing that gets October Equus frequent comparisons to the 70's Canterbury jazz-rock sound. I can't get enough of this kind of loud, dark, sinister prog rock, and anyone into the likes of newer prog/metal outfits like Kayo Dot and Sleepytime Gorilla Museum, and older bands like King Crimson, Magma, and Univers Zero should give this a listen." – Crucial Blast (USA) (November 2008). "Charybdis works extremely well on so many levels. Besides the fact that each of these musicians are extremely competent and articulate players, the band has a fabulous aura of darkness embedded in their arrangements. Repeated listens to Charybdis reveals something new each time and one will marvel at the amount of musical depth waiting to be uncovered within these multi-layered compositions. For a band that has only released two albums to date Charybdis is a remarkably mature record made by a band that sounds like they've been doing this forever. (Score: 4/5)" – by Ryan Sparks of Sea Of Tranquility (USA) (January 2009). "October Equus creates instrumental music in a style that is best described as RIO and avant-garde... If you like dark music like Univers Zero combined with the complexity of King Crimson then this album might interest you. The quality of sound is very good and the musicians certainly show their craftsmanship. The participation of saxophone really creates a sound that puts them aside from other bands. (Conclusion: 7 out of 10)" – by Edwin Roosjen of DPRP (UK) (February 2009). The album was also reviewed at: MADZ-zine (Russia), ProgArchives (USA), ProgressiveEars (USA), Sonic Frontiers (USA), Rate Your Music (USA), La Caja de Musica (Spain), MerlinProg (Norway), Progressive Area (France), Babyblaue (Germany), Monochrom-Cracked (Austria), Progwereld (The Netherlands), Arlequins (Italy).